There’s nail art, and then there’s nail art. It can be as simple or as complex as you make it. You can do a simple French manicure or you can create a complicated design. This week’s manicure? It’s pretty complicated – but that didn’t stop me from trying to tackle it. If you’re patient enough (and can keep a steady enough hand), I bet that you can tackle it, too. Plaid is everywhere – bags, shoes, shirts .. I needed it on my nails. But how?! Before I started, I created my own nail art stickers by painting Zoya’s Snow White onto Scotch tape. I let them dry while I painted the rest of my nails. Click here to read a full tutorial on creating your own nail art stickers. I prepped my nails with Nail Tek II and then started the look with one coat of OPI’s Die Another Day, a shimmering metallic red, from their Skyfall Collection. Typically, I like to do two coats of color, but for this, it would never dry if I used two coats of everything. After letting the red polish dry completely, I applied a thin strip of tape vertically and slightly off-center down each nail and made sure to press it down completely. (Hint: avoid ripping off the polish underneath by applying the tape to your hand first to remove some of the adhesive!) I applied two coats of Butter London’s Big Smoke, a dark metallic blue polish, and immediately removed the tape. If it’s a little messy here, don’t worry! Your DIY nail stickers will help to cover it. And then I waited. I told you you needed to be patient! It’s best to make sure your nails are completely dry here so that you can work with the DIY nail stickers without ruining your manicure. Once your manicure is dry, cut the tape with Zoya’s Snow White painted on it (should be dry by now) into skinny stripes to create your DIY nail stickers and apply two vertically and two horizontally to each nail, as displayed at the right. Cut the stripes to fit with nail scissors and repeat the process on each nail. Seal your stickers in with your favorite top coat – I used Essie’s Good to Go – and you’re … good to go! 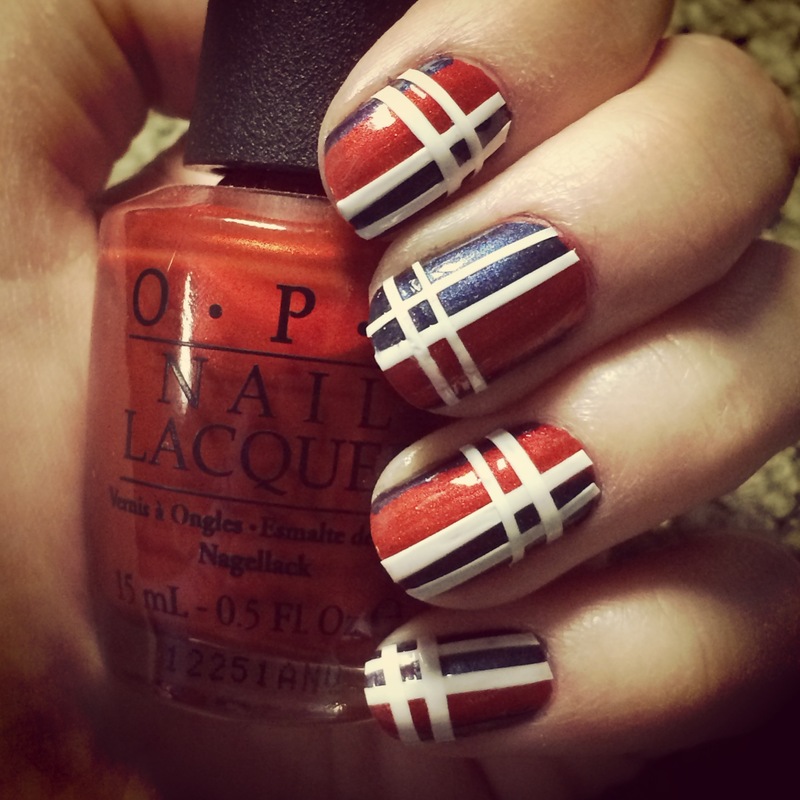 Let us know in the comments what you think of this Mad About Plaid manicure!